Bananas have a high level of potassium, and they make great portable snacks. They are also great for lowering blood pressure. Bananas are perfectly portioned so you will never eat too much of them if you want to keep your food intake under check. Plus, you don’t even have to wash them before you eat them. In order to get all the health benefits for your blood pressure, eat two bananas per day. You may add a third banana to the mix to get added benefits for your cardio-vascular system and prevent a stroke. Those with a family history of stroke should eat bananas on a regular basis. 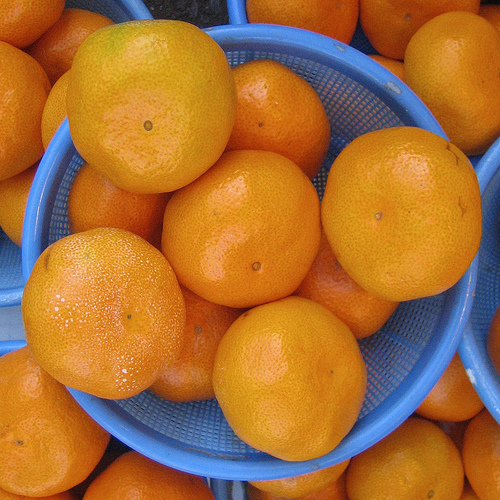 Oranges are rich in Vitamin C, which acts as an anti-oxidant. It can help you fight off colds by strengthening your immune system, and it can also help lowering your blood pressure. There are many ways to consume oranges. For example, you can drink orange juice or eat whole oranges. However, it’s best not to rely on oranges alone and combine them with other foods known for lowering blood pressure. It’s always best to eat an assortment of fruits in order to gain the best health benefits for your system. Prunes are great for the body. Numerous clinical tests have proven that they are great at controlling blood pressure. They will help lowering the levels of bad cholesterol in the body, which in turns keeps the blood pressure at optimal levels. Prunes are also known for their laxative properties, so they can be used against constipation. They are great for purging your system out of harmful agents so they are truly beneficial in more than one way. Kiwis are amazing for lowering blood pressure. These fuzzy green fruits are not only sweet and yummy but also very healthy. They will prevent high blood pressure and keep your health t optimal levels. In order for kiwis to have beneficial effect, you need to eat about 3 of them each day. It might not be feasible, since you might get tired of them quickly. Not to mention they might go bad or they might be too expensive for your budget. However, adding them to your meals every now and then is sure helpful. Make sure to combine them with other foods rich in anti-oxidants. They will help battling free radicals and they will sure help with keeping blood pressure under control. Papaya has a high Vitamin C content. Oranges are usually known for this but papaya actually has more Vitamin C than oranges. Not to mention that papaya also contains a great mix of other vitamins and minerals, such as amino acids and potassium. It’s clear papaya is a mighty-healthy food you will love to eat on a regular basis. Papaya is great for keeping your blood pressure in check and maintaining the optimal levels of blood pressure. The potassium content in papaya will also help with general health of your heart. Another great thing about papaya is that it tastes great! You will truly love to make it part of your daily meals. If it’s not already in your fruit rotation, consider adding it for all the beneficial effects it brings. Blueberries are famous for anti-oxidants they contain (same goes for raspberries). Anti-oxidants have a direct influence on your blood pressure and removing free radicals from your system. In order to improve your condition even further, make sure to combine blueberries with foods that do not increase the levels of free radicals in your body. For example, you may eat a bowl of fresh blueberries mixed with other fruits. It will make for a tasty and refreshing breakfast. However, make sure not to add any sugar to the mix. Also, avoid adding blueberries to pancakes or muffins. Pancakes and muffins will dilute the overall effect blueberries have on your body. Raspberries can help you keep your blood pressure under control. On how to use them, see advice for blueberries (they work in the same way). Watermelons are great and tasty so people love to eat them in great quantities. And it’s a very healthy choice: watermelons are great for your body. They can help maintaining your blood pressure on the optimal levels due to the L-citrulline they contain. This helps relaxing your arteries, which in turns keep blood pressure levels low. In order to get all the benefits of watermelons, make sure to use them regularly and not just as a summer treat. Eat watermelons regularly to fully explore all of the health benefits. It’s best to eat them in the morning and make sure to use only fresh watermelons. It’s ideal to start your day with fresh watermelons. You may also mix them with cantaloupe (see below). Cantaloupes are rich in potassium. In fact, one half of a cantaloupe contains the same amount of potassium as a banana. Keep in mind, foods containing high levels of potassium can help keeping lipoprotein cholesterol levels down, which is beneficial for your overall health. Also, cantaloupe contains other ingredients that help with lowering blood pressure. They also have a high level of anti-oxidants, which is very helpful. Cantaloupe can be added to many healthy meals, so you can use them in many different ways. You should eat at least a bi each day for the full effect. While you may eat then once in a while, it’s best to eat them regularly for the full effect. You’re probably tired of hearing how good oatmeal is for your health, but that’s the truth. Some people avoid it because they are not a fan of the taste, but oatmeal is truly a great way to improve your health and keep your blood pressure in check. You should definitely include it in your meals. Oatmeal is particularly great for those people who need to take medication to control their blood pressure levels. If you’re sick of all those medications you need to take, eat oatmeal regularly to help reducing the amount of medications you need to take. The good news? You don’t actually need to eat a lot of oatmeal to see the beneficial effects. Just one morning bowl will help keeping your blood pressure in check. It truly makes a big difference. One word of warning: always choose plain oatmeal and avoid the flavored types. These add all the unnecessary sugar, which will raise your blood sugar levels and thus your blood pressure levels. According to a clinical study performed in India, guava is amazing for lowering blood pressure. In order to get the full benefits of guava, you should eat it before lunch of dinner. It might be difficult to find guava in your part of the world, but it’s such a powerful food against high blood pressure that it’s sure worth an effort. This fruit can help lowering blood pressure because it contains high potassium levels. It also contains good amounts of fiber, which is beneficial for your digestive system. It also provides numerous additional benefits. For example, it is great in managing weight. It can truly help you with weight loss. Avocado is known to attach high blood pressure in numerous ways. Avocados contain high levels of potassium, which is beneficial for lowering blood pressure. They also contain fiber and mono-saturated fat. These three key ingredients attack blood pressure in numerous ways and truly do a great job at stabilizing your blood pressure. Avocados are tasty so it’s really easy to add more of them to your meals. They make a key ingredient to many healthy meals, and can be used in many ways, from salads to tacos. They can also be eaten fresh as a healthy fruit snacks between meals. Since they have a good fat content they will help keeping you fuller longer, so they contribute to weight loss. Dark chocolate offers numerous health benefits, so this is a great news for those who like sweets. However, it has to be dark chocolate and not milk chocolate. Milk chocolate, especially one found in mainstream candy bars, is not the best option. Make sure to use dark chocolate only, since it’s good with fighting off free radicals. In order to get all the health benefits and lower your blood pressure, make sure to consume small quantities of dark chocolate on a regular basis. Make sure it’s a small daily portion: do not over-consume it. Eating more than a small quantity will bring more harm than good. However, if you do limit yourself you will get all the benefits of dark chocolate. A great thing about prunes is that you don’t need to eat them regularly or in high amounts. Even little bit helps. However, if you do eat a serving of prunes per day it will help keeping your blood pressure levels under control. Dandelion is a great food source. More and more people are discovering its health benefits. It may seem like it’s just a random flower in your garden, but dandelion can help you maintain optimal health. It includes lowering your blood pressure. In order to control your blood pressure, you should eat dandelion root extract in a combination with potassium-rich foods. Dandelion is a diuretic and it will help the body remove excess fluid. Diuretics are important for treating blood pressure and dandelion is a natural way to achieve this. Wild salmon is great for lowering blood pressure. However, you need to make sure it’s wild salmon you want to use. It contains the omega-3s, which offer numerous health benefits for the body. One of the best things they can do is to lower blood pressure. They prevent the blood from clotting, which improves your circulatory system. You should add wild salmon to your menu a few times per week. It will greatly help prevent heart problems or even cancer. Wild salmon can be prepared in numerous tasty ways so it’s a truly great food to have in your home. Non-fat yogurt is great for lowering blood pressure. It also provides numerous other health benefits, so it’s definitely something you wish to include on a daily basis. Yoghurt contains potassium, as well as magnesium and calcium, so it’s very healthy for you. However, in order to enjoy health benefits of yoghurt you need to choose the low-fat, plain variety. Skim milk provides numerous healthy elements, such as calcium, magnesium and potassium. If you wish to use milk for tis health benefits, make sure it’s skim milk you’re using – it doesn’t contain too much fat. If you are not lactose intolerant you should include a daily glass of milk to your meals. Studies show that drinking one glass of milk per day helps lowering the blood pressure and keeping it on the optimal levels. However, it’s important to use milk only. Resist the urge drink milk in a bowl of sugary cereal or to eat chocolate chip cookies with it. Make sure to only drink milk solo. This is the best way to keep your body healthy. Also, it’s best to use organic milk only, since it’s the healthiest option you can have. Raising make a great and healthy snack. However, in order to gain all the health benefits, make sure to use only raw ones without added sugar. Always opt for the organic raisins to make sure they are made of organic grapes. They contain lots of potassium, which is great for lowering your blood pressure levels. Also, they are delicious so it’s not a hassle to eat lots of them. However, make sure not to eat raisin bran, since most brands add a lot of sugar to it. Believe it or not, spices can be great for lowering your blood pressure. It’s a great thing to know, because it means you won’t have to sacrifice the flavor to keep your blood pressure to the optimal levels. There are several spices known for relaxing the body and making the circulatory system function optimally. Some of the best spices for this purpose are garlic and oregano. You can add them to your foods to get instant flavor and help your health. They will help you maintain the optimal blood pressure levels. There are also other options. For example, if you like baking and sweets you can add some cinnamon. It is great for preventing heart disease and it’s also effective against high blood pressure. Nuts are great to keep blood sugar levels in check, and the same goes for blood pressure. Not to mention that nuts will help you feel full longer, so they are great for weight management. They will also help you build lean muscle. Nuts contain healthy fats so they will truly benefit your health in many different ways. Nuts contain potassium, which is a great ingredient for controlling blood pressure. The best nuts for keeping blood pressure low are almonds and pistachios. However, make sure not to overdo them: too much of a good thing may be bad for you. Stick to lower dosages and you will get all the benefits.